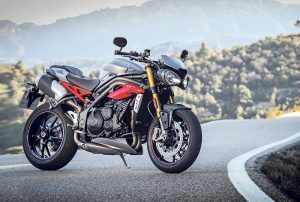 Triumph Speed Triple R offers a unique ownership proposition. It has its own set of character, usability, and a detailed build. A combination like this simply cannot be competed with. By the looks of it, this motorbike fits the role of a special high-ender rather than a production motorbike. A lot of attention has been given to the look of this model- a striking paint, a variety of textures and colours. Any owner would be proud to be seen on the roads with this. If your interests include- Alcantara, Ohlins Gold, and so on, then this bike is the answer. It offers adequate torque and a fair amount of grunt for the thrill seekers. Compared to Triple S, which uses Showa forks(43 mm) upside down, the Triple R opts for Ohlins; more precisely, the NIX30 Ohlins(a 43mm upside down). The rear makes use of a twin tube which is Ohlins TTX36 mono shock. Both of these are completely adjustable for rebound damping, preload, and compression. It allows for four different types of rider modes- track, rain, road, and a custom setting. Each of these modes allows a ride with 138bhp, but you have to take into consideration a suitable combination of factors such as the ABS mode, throttle response, and traction control intervention. These modes can be selected with a tap of the ‘Mode’ button on the handlebar and a touch of the clutch which gives the confirmation. One thing to remember is that once you turn the ignition off, the standard mode will be reset. The other selectable features include a seat unit which has sharper styling and traction-control. These selection features were modelled on the Daytona 675. The latest slim profile of the motorbike hardly goes unnoticed with a seat unit which is narrow at the front where the seat joins with the fuel tank. Compared to its competitions, the Triumph Speed Triple R has the best seat height. The Triumph Speed Triple R also offers a new dash display (LCD) that shows tank range, gear position, speed, revs, fuel level, and so on, along with a function to time the laps. When the extra sensors (optional) are added, it also shows tire pressure. The fly screen in the front includes an intake duct (integrated) and twin headlamps (re-designed) which are installed with Daytime Running Lights. Another noticeable feature is the use of bar-end-mounted mirrors. The shape of these mirrors is in the form of a teardrop which makes them handy and easy to adjust using an id-rear mount. The power is a little bit more than its earlier version- 138bhp. The more relevant changes are seen in the low and mid ranges. With the assistance provided by the new throttle system, the first twist itself is met with a pressing response which shows that below 3500rpm, this model is far aggressive than the previous one. The power delivery is refined and sophisticated allowing for a smooth ride along the mid range courtesy engine. The Triumph Speed Triple R has retained its rough character. It still feels bold and powerful. The under-seat exhaust system is more lighter and 'freer-flowing'; it does the perfect job in amplifying the 3-cylinder roar. This version has taken the name forward. Equipped with some top fittings, it appeals to riders from all age groups. Certain additions like high-end adjustable suspension and radially mounted four piston brakes make this bike totally unique.